Bookmaker Tipbet did it again! Now you can claim an exclusive €5 registration free bet - exclusive to BetAndSkill readers - to use on your favorite sports! Join via our special links and receive €5 no deposit free bet. Promo code: BAS. Betandskill and Tipbet have teamed up to launch a special offer for you! All our readers are entitled to receive a €5 Freebet which can be redeemed with the BAS bonus code! No deposit is needed! 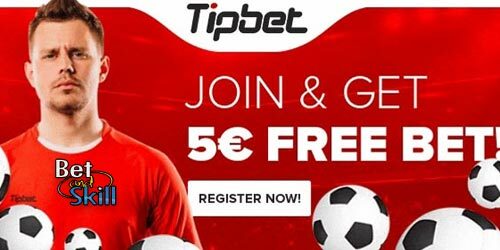 Enjoy you free €5 with no deposit required at Tipbet.com and keep your winnings! 4. Get your exclusive €5 free bet without deposit! The five Euro (€5) bonus will be credited to customer’s account by entering the code "BAS" at the Offers section under Account Summary. These General Bonus Terms and Conditions are posted on the internet in various languages reflecting the same principles. In the event of any conflicting foreign-language versions of these General Terms and Conditions, the English version shall prevail. The same principle applies for any applicable bonus condition. "Tipbet €5 no deposit free bet. Bonus Code: BAS"